We had the opportunity recently to try out The Exploring Creation Field Trip Journal ($22.00) from Apologia Educational Ministries. This journal is the answer to the problems that I have been experiencing. Our family loves field trips. We travel around a lot, and if you follow us, you know that we have spent 3 months on the road already this year and much more to come. In one trip we went from visiting the Alamo to seeing Boston Harbor in a week. With all of our adventures, how do we keep track of them? 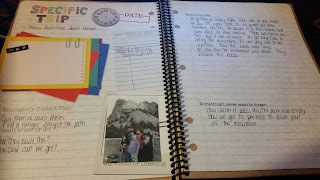 I do use the blog to track our travels and all our adventures. But that is hard to show our assessor. The other issue I have is making sure they remember the trip that we have been on. I tried having each one of the kids journal, but the kids really do not do that well. So we usually just review a lot verbally and if we come across a topic in our studies that we have seen in a museum or other field trip we might refer back to the pictures. The Exploring Creation Field Trip Journal allows us to document our field trips and also gives the kids a place to write up their thoughts and what they have learned. The Exploring Creation Field Trip Journal (All ages and grade levels) is more than just a place to journal about your experiences though. They also include information on how to plan a field trip, and field trips do not even mean you need to leave the house. I really liked how they pointed that virtual field trips are also experiences. For those new to homeschooling, the “Preparing for a Field Trip” section has great reminders on to be organized when going on a field trip or even help with planning one. There are also two pages of ideas on places to visit if you are just not quite sure where to go and what to do. 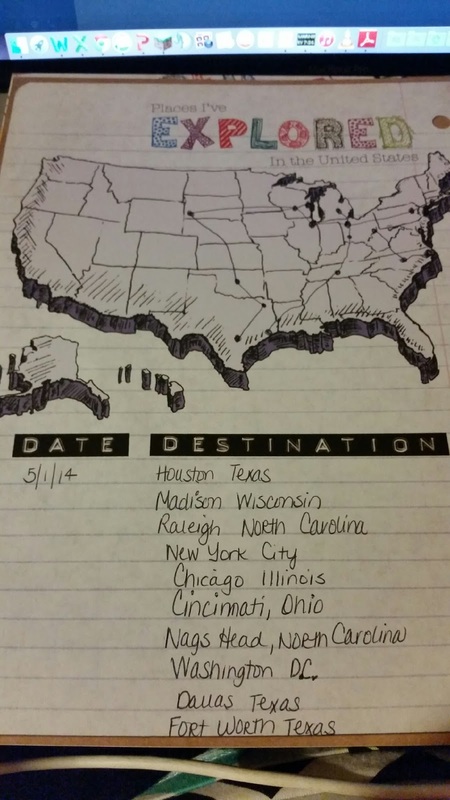 There are areas to mark where you have visited in your state, in the United States and adventures you have been on worldwide. Each page is ready for you and your student to start using before you begin your adventure. There is a section to help you make a list of what you want to learn at the sight you are visiting. And what materials you studied while prepping for your visit. There is room for a drawing or a picture from the location. When you have completed your adventure, you can write about your day. This could include something you thought was funny or something you thought was weird that happened. The student could also record the answers to the questions that they were wondering before their visit. Since field trips can be anything from visiting a monument to taking a walk in the woods, there is even a special section for your favorite spot. The student can journal about a favorite outdoor spot throughout the year. Pictures can be drawn or printed and put on the page to document what this area is like during each season. The last section of The Exploring Creation Field Trip Journal is for drawing. There are several fun prompts that students can use their imagination to capture the fun experiences they have been going on. How have we been using this in our family? With all of our handwriting issues, we have been working on a family journal. We started making a journal of a few of our favorite trips the last couple months. 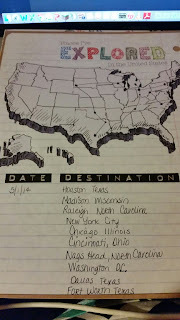 We also started marking the states/locations on the map. The pages are colorful and easy to use. Plenty of space to write about your adventures. What we do is I ask them questions about the place we are visiting. I simply transcribe their feelings and thoughts into the journal. I printed pictures from our trip and added them to the pages. It was very easy to do. When we are done with our school year, we will have a notebook full of information about all the wonderful places that we have visited to share with our assessor. My main question is.....Where has The Exploring Creation Field Trip Journal been the previous 6 years of my homeschooling. With our family, we will definitely need another book or two to keep filling in all our adventures. And I can't wait to show this scrapbook of our field trips to our assessor, and oh it will be nice to look back on all the memories we made. You could also track club events in The Exploring Creation Field Trip Journal, such as 4H, Girl Scouts, Boy Scouts, etc. Can be used for many areas of your homeschool. Several members of the Schoolhouse Review Crew were given the opportunity to try out The Exploring Creation Field Trip Journal. Take some time to read how they used this product from Apologia Educational Ministries by visiting the blog listed below.